If you follow me on Instagram, I hope it’s clear that I don’t take it too seriously. 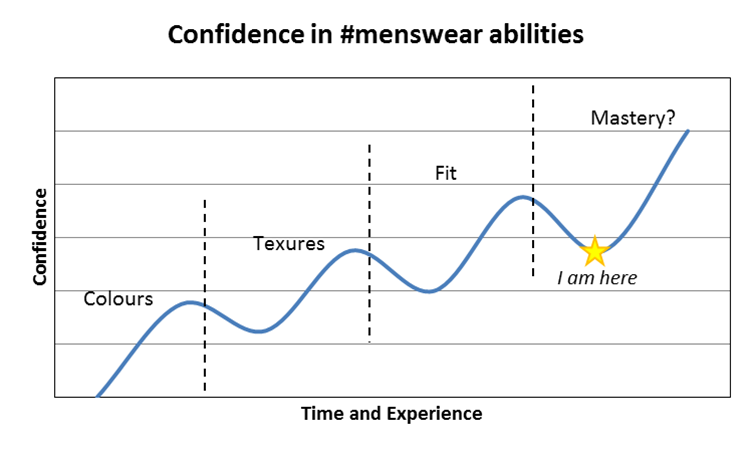 I mean, let’s be honest – it’s an already border-line narcissistic behaviour, and I’ve justified to myself that self-deprecation and mocking the #menswear thing a little bit here and there balances the whole thing out. I do enjoy posting pictures of the outfits I wear. It allows for a more objective review somehow. I think some of this can be explained by the fact that I shoot my photos at chest height, a perspective I can’t see from when looking at myself in a mirror. Also, that mirror image is flipped vs how everyone else would see me (unless they’re also looking at me in a mirror). These are the two biggest factors that I believe allow for a more detached and less personal view of what I am wearing. Instagram isn’t the best venue for reflection, discussion or constructive criticism on the outfits. I think part of that is because posting there is at least in someway a source of validation or positive reinforcement (for myself and others who post there) – the goal is likes and engagement, and to inspire. It’s the same reason when I comment on other peoples posts, I’m always looking to mention what I liked about their content. Every now and then, the WAYWRN (What are you wearing right now) thread on Style Forum is great, as members will offer constructive input on what elements worked or didn’t, and suggest alternatives. That is what I enjoy about this whole online community of men’s clothing nerds – the analysis, the reflection, the history. I’ve never read Alan Flusser’s books, nor have I studied the eccentricities of Gianni Agnelli’s dress habits, yet I’ve learned about both. Maybe I’ll spend some time better acquainting myself with these pillars of classic menswear at some point in the future, but for now I’m happy to muddle along developing my own sense of what makes a good outfit without the context or restrictions of fundamental rules or structure. Some of what I’ve learned about these constructs (pairing white shirts with odd jackets, sliding scales of formality and context, white shirt and white pocket square, etc.) has influenced the way I dress now, but not as much as looking at what I put together with a critical eye, seeking out the feedback of those I am inspired by, and reviewing why I like or don’t like elements of outfits posted by people I follow. It’s kind of funny how I’ve evolved through my interest in menswear. When I first started “dressing up”, I was often self-conscious about it – both online and in real life. Some of this was a confidence thing. Being inspired by, but unable to emulate looks I liked, either due to a limited wardrobe or a limited understanding of pulling together different elements was challenging. Over the course of the last few years, I’ve begun to feel more confident about it. You have to let go of the fact that you might stand out in an increasingly casual world. Now, much of the #menswear movement has skewed far to the “peacock” end of the spectrum, with the goal of attracting as much attention as possible by pairing things that are jarring; whether it is colours, patterns or mixing inherently formal and informal pieces into some kind of a patchwork outfit. I notice this influence in the fact that my most liked posts on Instagram are often the loudest – either featuring many patterns, or bold colours. In real life, my goal isn’t to stand out by calling attention to the pieces of clothing I wear. I try to present a well put together version of myself where it is apparent that I dress well and care about my image, but where the average person wouldn’t be able to pinpoint exactly what about the outfit is compelling. Getting asked advice from friends about putting together outfits, or where to buy a certain piece of clothing has contributed to my confidence. Self-reflection has also been a big confidence booster. Each time I can take an honest look at what I’m wearing and identify things that worked well, but also areas of improvement, I can internalize those realizations and use them in future #menswear contexts. I’ve shared some of these already (buying my first odd jackets, suits, and wearing the navy sport coat), and I hope to continue learning and posting about what has helped me become more confident in my dress. Boy, this really turned into a bit of a self-indulgent novel of a post. If nothing else, I hope I’ve been able to share a glimpse of what drives me to post on Instagram and to start a blog. Sorry there are no pretty pictures in this post. I’ll make it up on the next one.